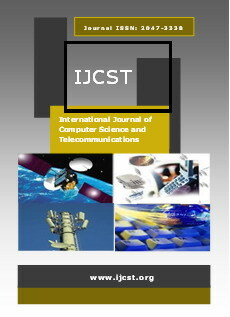 Abstract - In this paper an experimental characterization of a typical indoor wireless propagation channel is performed. This channel characterization is needed for short range applications (<10m), utilizing Ultra-Wideband Impulse Radio (UWB-IR) techniques. Both the line of sight (LOS) and the non line of sight (NLOS) scenarios are taken into account. The characterization is done using time domain measurements of the transmission-reception path, using very short pulses that are propagating through the wireless channel. In order to obtain the channel's impulse response we utilize the CLEAN algorithm for the time-domain deconvolution technique. The characteristics of the channel that are measured in this study are the path loss, the shadowing effect, the mean excess delay spread, the RMS delay spread and the number of dominant paths. Abstract - Internet has become pervasive in our daily life and Cloud computing is an emerging paradigm where computing resources are offered over the Internet as scalable, on-demand (Web) services. A company deploying an Internet service needs to invest huge amounts of money on infrastructure needs to serve possible users which is not a problem for large enterprises but when it comes to Small and Medium Enterprises (SME) affordability becomes a huge factor with the huge infrastructure come problems like machines failure, hard drive crashes, software bugs, etc. This might be a big problem for such a community. Cloud Computing is the ultimate solution to this problem. Rather than buying, installing and operating its own systems, an organization can rely on a cloud provider to do this for them. Cloud Computing key market leaders like Google, Amazon, Microsoft and Salesforce.com introduces new operating and business models that allow customers to pay for the resources they effectively use, instead of making heavy upfront investments. The aim of this paper is to provide the concepts as well as the technology behind Cloud Computing in general and analyze most popular platforms, The Google App Engine, Amazon Web Services, Windows Azure Platform and Force.com. This paper also discussed to identify companies for their favorability in the migration to the Cloud Architecture. Abstract - Approximate Reasoning using fuzzy logic provides a realistic framework for human reasoning. The concept of vague logic introduced by Gau & Buehrer  is the higher order fuzzy logic. Our present work is based on the concept of vague Logic. In this paper we are defining the approximate reasoning implication rules Generalized Modus Ponens (GMP) and Generalized Modus Tollens (GMT) using vague logic. As a special case we are also reducing the concept of GMT and GMP using fuzzy logic with the help of example. Abstract - To achieve better performance in parallel processing, which is implemented based on java application. In this article, we work on high performance of parallel processing in a local network that computer can be connected as a form of the cluster making available Java Virtual Machine (JVM). However, java is not suitable for parallel processing, JavaParty adds Remote Method Invocation (RMI) to the java application. This article present performance of parallel processing based on java using JavaParty. The result shows the performance of parallel processing has resulted in decrees the execute time by adding JVM. Advance in JavaParty had provided easy to use tools and environment or the development of parallel application. Abstract - A novel approach to identify the sense of the word appearing in a sentence is proposed in this paper. The basic idea is to facilitate the natural language processing through the broad manifold of unsupervised observations. The target word is tokenized and a relationship with other words is constructed through mapping to constitute the training set using specific domain wordnet. It constitutes the corpus from where similar word senses are arrived at and there from be-hives its role into the question answering system. The scheme is evaluated through precise performance indices for two specific domains to illustrate its applicability in the present day context. Safwan Al salaimeh, Evlanov M. V. and Pushkarev A. N.
Abstract - The basic evaluation of the effectiveness of control automation identifies their strengths and weaknesses. Based on the analysis offered the basic principles of estimating the economic efficiency of logistic Information Management system (LIMS) defined the main directions and the main difficulties of such estimation. Abstract - With video conferencing becoming extremely popular in wired and wireless network, efficient utilization of the network bandwidth is important to achieve Quality of Service (QOS). Internet Protocol (IP) multicast is a routing technique that allows IP traffic to be sent from one source or multiple sources and delivered to multiple destinations. Instead of sending individual packets to each destination, a single packet is sent to a multicast group, which is identified by a single IP destination group address. In this paper it is proposed to compare the performance of video conferencing using unicast and multicast communication using Protocol Independent Multicasting-Sparse Mode (PIM-SM) modes.